Has Loch Ness Monster's tooth been found? Are Paranormal Creatures Real or Fake? A couple of American students visited Loch Ness in early March 2005 with the goal of finding the reality about the monster. They hired a local fishing boat and started out in the still waters. A few hours later, they saw a mass afloat the water and on getting closer, they discovered that the mass was actually a deer's distorted leftovers. One student exclaimed, “The animal is torn to pieces with the hind legs completely cut off!” They discovered a bony protrusion as they examined the deceased deer. With the assistance of a screwdriver, they ripped the rib cage and were surprised to find that the protrusion was actually a tooth! The tooth's length was approximately four inches and was indeed very sharp. With excitement, the two students summoned a local boat to display their finding. However, the person was found to be some sort of a local enforcement officer (a few reports claimed that he was the local Water Bailiff while some others claimed him to be an officer with Fish and Game). 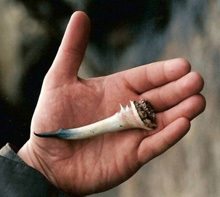 The deer's remnants and the tooth were taken away from the Americans. However, the two students already had pictures of the remnants and the tooth. After their return to the United States of America, the two students worked on ways to be able to recover the tooth. Their efforts paid off when they got in touch with Bill McDonald who was a private detective and an expert on Loch Ness. With the assistance from Mr. McDonald, the involvement of New York Times best-selling author Steve Alten became possible. Coincidentally, Mr. Alten at this time was writing a novel known as the Loch. He was very impressed with the students' findings and incorporated their discoveries by re-writing a portion of his book. After several months and many efforts, the students have still not been able to recover the tooth. Therefore, convinced about their cause and the backing of their financial supporters, the students are offering a reward of $100,000 to the person who is able to retrieve the tooth, which according to them rightfully belongs to them. Many experts have come forth with their opinion on the accuracy of Steve Alten's book. They base their opinions after viewing photographs of the cadaver and the tooth. Many experts say that although the book is a fiction novel, its accuracy surpasses some books on Loch Ness that are considered as non-fictional. For me, I am convinced on the genuineness of the tooth and believe that irrespective of whether the American students are able to retrieve the tooth or not, the real Loch Ness monster will soon be discovered for the entire world to see.